Figure skate blades are typically made of tempered carbon steel, coated with a high-quality chrome. Lightweight aluminum and stainless steel blades are also popular with skaters. Figure blades are about 3/16 inch (4 mm) thick and may have a slightly tapered cross-section. There are different blades for different levels of skaters which often correspond to a skater's age, size and skill level. Blades for advanced skaters often have larger toepicks and different curves than blades for beginner, intermediate and recreational levels. With the most comprehensive line of figure boots and blades available, Riedell has the perfect skate to help any skater  from beginners to Olympic champions  soar to new heights. 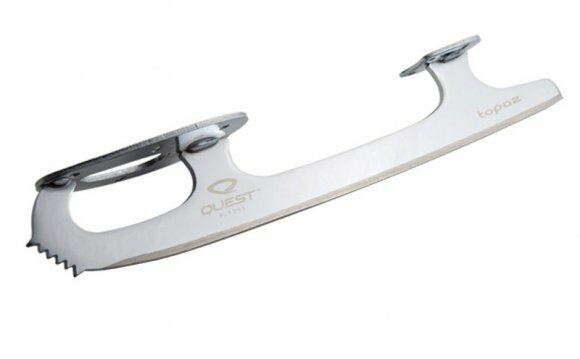 To find the boot and blade to best serve your individual skating needs, review the Blade Recommendations Chart. Whether youre skating in ISI, Skate Canada or USFSA programs, Riedell has the skates to help reach your dreams. Your style says a lot. It tells others who you are as a skater and expresses your individuality. Mitchel and King specially designs each of its blades with the individual skater in mind. From beginners to world champions, MK has the blade you need to skate with style. So go ahead, skate the way you want to skate, we've got your blade. For the most technically advanced blade on the market, there simply is no better choice than John Wilson. Every John Wilson blade is produced using laser technology for unmatched precision on the ice. And John Wilson takes the time to craft its blades from the highest quality steel, coatings and treatments with the utmost attention to detail. It is a commitment to quality that guided us yesterday, remains strong today, and will continue to be there for you tomorrow.